At Arlington Cemetery, on February 18, 1955, family and friends gathered in the Memorial Chapel to say good-bye to Captain James B. Furuholmen, fatally injured while performing the duty he knew and loved best. Jim’s last flight was a night navigation training mission from Cherry Point MCAS to Shaw AFB, South Carolina. Shortly after takeoff from Cherry Point, Jim notified the tower that he was at 17,000 feet, 1,000 feet on top of all clouds, and proceeding on course to Shaw. He was found the next day near the wreck of his jet trainer about 60 miles from Cherry Point. In trying to deadstick his crippled aircraft into a small civilian field he apparently waited until too late to successfully bail out. Jim was an Army Brat, the son of Colonel Bjarne Furuholmen of the Class of 1924. As a child Jimmy lived the interesting and happy life of the pre-war army family, as his family moved from station to station -- Schofield Barracks, Fort Bragg, Washington, to name only a few. After graduating from high school Jim attended Vanderbilt University, in the state he was fond of calling home -- Tennessee, and while there was initiated into Sigma Alpha Epsilon fraternity. Academy -- and finally obtained his appointment and entered on July 1, 1943 with the Class of 1946. 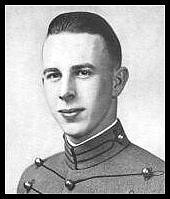 At West Point Jim thrived on cadet life, as he arrived well-briefed on all phases of cadet activities dating back to the years when his father was stationed there. J.B. enjoyed all the many facets of our existence at West Point, parades, hops, inter-murder, tactics, trips and, to a lesser degree, academics. Most of all Jim enjoyed the warm companionship of his friends in H-1 Company and the rest of the Corps, the bull sessions after supper before call to quarters, the week-end leaves with their welcome relief from the sometimes tedious life in barracks, and the week-ends of dragging for football games and big hops. While a cadet, Jim realized his second ambition to be accepted for flying school and received his wings at graduation with the other members of his class. One of the proud moments of Jim's life was at graduation when he was formally welcomed into the Long Gray Line by members of the Class of 1924 -- his father's classmates -- with a formally inscribed scroll. In July after graduation Jim, assisted by his friends and classmates, married the former Ann Hoover in a gay and happy ceremony in Washington, D. C. Reporting to Williams Field in Arizona later that month, Jimmy started to learn the serious but exhilarating business of flying fighter type aircraft. From Williams Field, the Furuholmens moved to Shaw AFB, South Carolina, where Jim continued to practice his favorite trade as a fighter pilot. Here at Shaw his first child, Ruth Ann, joined the family at their converted barracks apartment -- the apartment that was the center of social activity for all the junior officers on the base. It was here that people came to believe that no social gathering at the club was a success until it concluded at the Furuholmens; eating a midnight meal, and following Jimmy's lead in singing all the old Air Force songs. Reconnaissance Squadron at Yokota AFB near Tokyo; and started into the business that was destined to be the high point of his career. Ann and Ruth Ann joined him at Yokota in early 1949. Here in 1950 "Barney," James B., Jr., entered the scene as Jim and his family enjoyed the pleasant life exploring Japan. By the time of the outbreak of the Korean War, Jim had become one of the most skilled tactical reconnaissance pilots in the Air Force and was sent immediately to combat to aid in accomplishing this vital mission. After completing his combat tour, Jim and Ann and the children were sent back to Shaw AFB, where Jim spent the remaining years of his life teaching the intricate skills of tactical reconnaissance to pilots enroute to Korea. After a short one year tour with the Marine Corps at Cherry Point, Jim returned to Shaw where be was stationed at the time of his death. Although Jim is gone. We who knew him can never forget him. He loved the life he led -- his boyhood in the army, his life at West Point, and his career in the Air Force. Jim was a man's man in every sense of the word from the early days of his life to the end. He took pride in the unofficial motto of' the Tactical Reconnaissance Pilot -- “Alone, unarmed and Unafraid"; although in Jim's case he was never alone in the true sense, armed as he was with his confidence in himself, and his knowledge that he was doing a job that he liked to do and that needed to be done. We who are left behind have gained strength from Jim and his approach to life -- strength to continue the job and carry it through to the end -- secure in our knowledge that our most eloquent tribute to Jim is to remember him as he was: strong, generous, and living life to the hilt without regret or apology for any trial that came his way. Randy Adams, Phil Farris and Twill Newell.